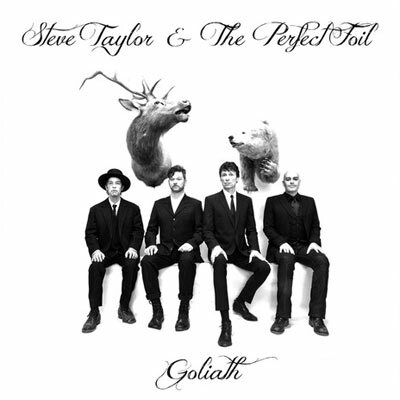 CD Review: Steve Taylor and the Perfect Foil, "Goliath"
You should not have to wait a quarter century for one of the best albums of the year. It was almost like a countdown. Four years ago on his Facebook page, former rock singer/present movie maker Steve Taylor posted a picture of himself doing that awful, downcast stare that has graced nearly every Stanley Kubrick movie. The look projects a sinister quality using the brow like a visor. It turns an ordinary glare into something quite menacing, and all one has to do is lower their head a bit. Three years ago, Taylor posted (paraphrased) “New music in the new year — promise.” He hadn’t released an album as the frontman since the early ’90s, but had been a primary force behind The Newsboys, Sixpence None The Richer, and Chevelle. No new music came, but there was talk of the Taylor/Peter Furler project, so it seemed as if some action was happening. Last year in the fourth quarter, the Kickstarter campaign began for Steve Taylor and the Perfect Foil, a new band featuring Furler on drums, Vector guitarist Jimmy Abegg, and everything else by John Mark Painter of Fleming & John fame, as well as the go-to orchestrator for most of Ben Folds Five’s albums. This year, Goliath arrived. Now the first tick of the countdown seems wholly unrelated to the rest, more of an homage from one filmmaker to another, but it is eminently appropriated when one actually listens to Goliath. Taylor, always known for his humor as much as his rock and pop, regularly leavened his work with little jokes and barbs, often showing the absurdity of human foibles through it all. Goliath has humor too, but it is a more convicting and convicted record. There are no “Am I In Sync” or “Easy Listening” diversions here. Taylor has lowered his head and the stare is sardonic and penetrating. And, almost an anomaly in the pop music world in our current climate, the album is a true rock record and it is an angry one at that, sometimes coiled and waiting to strike, sometimes not waiting at all. The production is assured but leans toward the dry side, feeling so close to the listener you can almost smell the breath of the primaries. Opening with the propulsive “Only A Ride” and not really letting up until the back-quarter of this eleven-track album, Taylor and the Perfect Foil take a lot of chances. They’re also in tune with their rock contemporaries, most of whom reign in the strata between the underground and the breakthrough. “Moonshot” has a bit of the white funk of Spoon, circa Gimme Fiction. The devastating closer, perhaps the most sedate of the tracks, “Comedian” has that icy reservation found in the best of The National’s recent efforts. You would think this album wouldn’t have come out as risky as it has. The goodwill that has been afforded to Taylor after such a long absence from behind the microphone virtually guaranteed he could have done anything he wanted to. He could have set old high school poems to music, so long as he threw some style on it, and it would have been accepted (at least initially). Instead, he and his band has arrived as beginners, much as he did when he fronted Chagall Guevara (also in the early 1990s). They have attacked the stage as if they were never going to get a shot at this again, so get it all down in this performance, this song, and don’t worry about the friends you might lose. I’m sure there will be plenty of lyrical misinterpretations. People will make judgments based on surface impressions without digging down deeper with their own penetrating gaze. Taylor is, after all, the guy who parodied a tarot card for the cover of I Predict 1990 and was then accused of siding with mysticism. Safe has never been his forte. So be it. Sometimes the worst thing you can do when making art is to try to please everyone anyway. Steve Taylor and the Perfect Foil are now out in the world with Goliath, and it only took twenty-something years with a four year countdown to get there. Although Taylor has expressed his next step is probably to go back to making movies, let’s hope not. You should not have to wait a quarter century for one of the best albums of the year.